Just when you thought you’d hibernate all winter, the creators of Yours and Owls Festival are ready to lure you back into the light with The Last Frost. Not just a warm up for Yours and Owls Festival, but a roaring, blazing fire to celebrate the approaching end of winter, The Last Frost boasts an eclectic and epic line-up of artists from Australia and New Zealand ready to throw a log on the fire and toast your marshmallows at the University of Wollongong’s Innovation Campus. 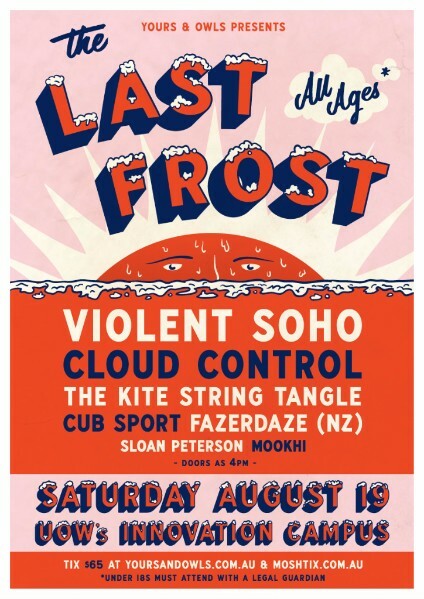 Featuring Violent Soho, Cloud Control, The Kite String Tangle, Cub Sport, Fazerdaze (NZ), Sloan Peterson and Mookhi, the diverse line-up will warm those dancing limbs and put a smile on your face. Seemingly out of nowhere, Violent Soho propelled themselves into the hearts, minds and stereos around the world with their wildly well-received LP Hungry Ghost, and 2016’s ARIA #1 Album and massive follow up WACO, an album that spared no punches with hits Viceroy and Like Soda, and finally swept the band up on a series of sold out dates on two ginormous national tours. Breaking away from the studio for this special celebration, Wollongong audiences are about to be royally treated to the punk rock frenzied genius of this Brissy band as they sneak in one last ‘gong show for the year. Get sweaty! Sydney psych pop outfit Cloud Control have always been defined by happy chaos, ever since they formed on a whim for a university band competition in 2005 and went on to create the ARIA nominated first album Bliss Release. Since, the band have become internationally renowned for their dynamic live performances, lush layered harmonies, and now their grungy hit new single Rainbow City which they’ll be bringing to the stage in Wollongong. With the forthcoming third full-length and self-produced album due out later this year — their first since 2013's acclaimed sophomore, Dream Cave - the band are coming full circle and making their return to a uni campus ready to celebrate. Just in time for The Kite String Tangle’s debut self-titled album to be released on the 14th July and to properly get under your skin, the Brisbane based, ARIA nominated producer has already been treating your ear canals to singles Selfish and The Prize, a return to pop tinged electronic and Danny Harley’s soulful vocals. Harley has enjoyed a great run since the release of his breakthrough single Given The Chance in 2013 including sold out national tours and appearances at Falls Festival, SXSW and Splendour In The Grass under his belt, the highly anticipated debut album has been a long time coming with the ‘gong set to be amongst the first to experience it. Brisbane’s Cub Sport had a career-defining 2016 with their dream-pop debut album This Is Our Vice. Featuring well-loved singles Only Friend, I Can’t Save You, and the massive hit Come On Mess Me Up, the record launched the band into the stratosphere and saw them come in at #24 in triple j’ Hottest 100. Having received critical acclaim internationally, the band spent the majority of 2016 on the road celebrating with their legion of new of fans. Amongst headline tours of Australia, North American, the UK and Europe, Cub Sport also joined The 1975 for their Australian arena tour after catching the attention of the group’s front man Matty Healy. Now, Cub Sport have finished putting the final touches on album number two, set for release late 2017. The first single off the new album, gospel-inspired single O Lord, shows a band hitting their stride and truly making their mark. Check out their goosebump-inducing Triple J Like A Version cover of Kanye West’s Ultralight Beam if you need any more convincing of their genius. New Zealand indie darling Fazerdaze, aka Amelia Murray, has been preparing to take over the world with her new release Morningside, her first full-length record described aptly by NME as “elegant dream pop”. Mesmerizing and captivating audiences with every performance, Murray has already achieved so much in such a short time. She’s been praised by NME, played with Unknown Mortal Orchestra and Connan Mockasin, was invited to join the Red Bull Music Academy in Montreal, joined the line-up for The Great Escape Festival, and is rounding it all up with a short Australian tour this year featuring Wollongong! Although only 24, Sydney’s Sloan Peterson lives by a soundtrack of ‘50s guitar pop and modern garage rock. Songwriter Joe Jackson is immediately influenced by everything from Elvis, to Wanda Jackson or the fashion statements of Nancy Sinatra and David Bowie - Sloan Peterson is the sum of these influences that adds up to so much more. Jackson’s music bursts with warmth that can be heard in new single 105. With a self-titled album forthcoming in 2017 and a spot at Bigsound and Freedom 2.0 on the horizon this is clearly only the beginning with Jackson set for take-off. Olympia Henshaw aka Sydney producer Mookhi, grew up in both Hong Kong and India where she absorbed her musical surroundings, favouring dark eastern-based scales, chords and melodies. From these exotic beginnings, Henshaw gained quick following as a complex and sophisticated beat maker. Mookhi delves into the genre of electronic hip-hop in the most seductive way, building lush tapestries of sound live that are unique with each performance. Foul Play is Mookhi’s first single and unsurprisingly it's already flying up the Triple J Unearthed charts complete with lush vocals from teaming up with the soulful Billy Fox. The Last Frost is an all ages event (minors must be accompanied by a legal guardian).